Our WKO4 power-duration-based iLevels plans will make the difference in your training this season. This 12-week base training plan was created by Tim Cusick, coach of champion Amber Neben and pro Emma Grant. Your workout prescription will be individualized based on your data following the Power-Duration Curve as you gain fitness. iLevel plans are for the serious, competitive, power-training cyclist. Whether you’re racing or getting ready for a big event, these plans will give you all the tools you need to kick start your season. To use this plan, you will need to have a power meter and the TrainingPeaks WKO4 software (if you don't have WKO4 or if you don't train with power, you can still get these cutting-edge workouts and plans; just search for the Coggan Classic versions). This plan uses the advanced iLevels training protocol developed by Dr. Andy Coggan and the new training metrics available in WKO4, like FTP/FRC, FRC, and PMAX. Visit wko4.com to find out more about WKO4 or to watch Coach Cusick’s free educational WKO4 webinars. These plans use the cutting-edge workouts that Tim prescribes for his pro athletes, with focus on fatigue resistance, intensive and extensive workouts, and increasing your Time to Exhaustion (TTE), Stamina, and FRC (functional work capacity). All our plans include predicted TSS and ongoing testing. Tim Cusick has written dozens of training plans for many different areas of cycling: road, gravel, time trial, mountain bike, cyclocross, indoor training, and more. Click here for a full list of his current plans by sport type. Join the WKO4 Power Users group! Click here to request to join our private Facebook group for WKO4 users. It's a great place to ask questions, make suggestions, share charts, and see how others are using the software. Click here to view a list of frequently asked questions about our training plans. If you don't find your answer there, please email Coach Kathy Watts. CADENCE: 85-105 rpm. Vary cadence throughout ride and work on pedaling form. CADENCE DRILLS: 1 x 50 minutes of alternating high cadence (HC) for 5 minutes (95+ RPM) and self selected cadence for 5 minutes. You get faster when you're resting and recovering, not when you're working hard! Rest days are about going easy enough to really allow your legs to recover, so no efforts over iLevel 1 today. Take it easy and look at the scenery. Ride remaining prescribed time in your Endurance zone. REST: 3 minutes easy riding between/after first two, then 3-5 minutes after last interval to recover before MS2. This 5-minute effort should be done at maximum. Start the effort at a high pace, but not so hard that you cannot finish strong. Really hammer out the last 45 seconds. The goal is to generate a max 5-minute VO2Max test. Ride any remaining time in your Endurance zone. 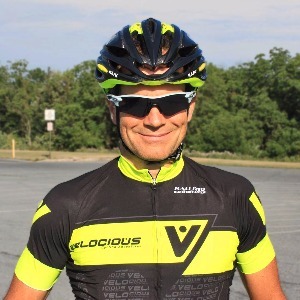 Tim Cusick is the TrainingPeaks WKO4 product leader and the owner of Velocious Endurance Coaching. His expertise in training, racing, and data analytics offers a unique approach to training that guides his clients to amazing success. He currently coaches world champion Amber Neben, road pro Emma Grant, and numerous other pros and age group racers. Tim has 100 plans in all cycling disciplines! Need help picking a plan? Fill out our survey here: https://goo.gl/forms/bkGSAYA9VzV9tsq22.